This season can be different! 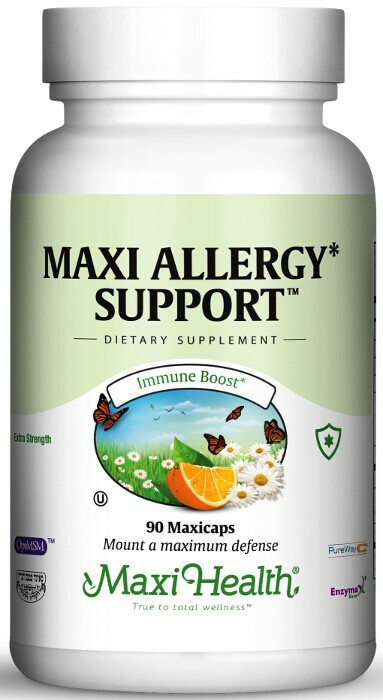 Try Maxi Allergy Support™. Your allergies affect your nose, eyes, throat, lungs, stomach, skin and nervous system. They can even give you headaches and even bring on fatigue and depression. Allergy symptoms occur when your body's immune system overreacts to harmless substances in your environment. The main causes of common allergy symptoms are histamines that are being released inappropriately and in exaggerated quantities. Maxi Allergee Support ™ is our unique product formulated to help people with allergies. It contains pantothenic acid, vitamin C, MSM, citrus bioflavonoid, and bifidobacterium bifidum to create the most powerful and wonderful allergy protection. Read further to see! Pantothenic acid (vitamin B5) supports the body’s natural cortisone that counteracts allergens and alleviates allergic symptoms. It also supports the adrenal glands which controls how a person responds to stress. MSM (methylsulfonylmethane) supports the blocking of allergens from mucous membrane receptor sites. MSM softens the cell walls. This allows allergens, foreign proteins, and any free radicals to be moved out of your system. Vitamin C and bioflavonoids both support histamine reduction. Probiotic bifidobacterium bifidum supports improved gut flora to help reduce food allergies. Give you and your loved ones the support they need with Maxi Allergy Support™! Take six (6) Maxicaps™ daily, two (2) with each meal, or as directed. Other Ingredients: Vegetable cellulose , microcrystalline cellulose, magnesium stearate and Enzymax® (Calcium carbonate, bromelain, papain, lipase, amylase, protease, silica). This product contains no animal products, yeast, soy, wheat, gluten, salt, sugar, milk, artificial preservatives, flavors or colors. Enzymax®, a vital digestive enzyme complex, is a registered trademark of Maxi Health Research® LLC. • OptiMSM® is a registered trademark of Bergstrom Nutrition. • PureWay-C® is a registered trademark of Innovation Laboratories, Inc.